Instagram is taking major strides with dramatic changes in the latest update of their incredibly popular photo app, available today on both the Apple App Store and Android marketplace. Instead of merely introducing a myriad of new filters with which to view your subjects, Instragram 3.0 introduces Photo Maps, which creates a visual history of where you've taken some of your favorite photos. Following in the footsteps of its parent company Facebook, this latest update to Instagram hopes to emulate Timeline in the way it creates a story about who you are and where you've been. Instagram's CEO Kevin Systrom related the company's reasoning behind the new feature, in a published report. "How many times have you gone to a user profile and scrolled back to the beginning? No one does," Systrom said. "This is a way to take a step back and reflect on everything that's happened over the past two years. Photo Maps is such a fun way of re-descovering yourself, but not just yourself, all Instagram users." Just because Instagram introduced this new feature doesn't mean everyone is automatically forced to start using it. The gates of your internet privacy will remain closed as long as you don't tag any of your photos with the location. Post-update, a new pop-up appears within the app when you first geotag a new photo, tasking you with being mindful of revealing too much. "Be mindful of which photos you add to your map," the warning states. "Their location will be visible to everyone who visits your map." Any photos you've previously tagged will show up on your map unless you remove the geotag, but the process is streamlined and simple, allowing you to keep whatever information you have shared private with the press of a "deselect all" button. "We're not introducing any new data," Systrom continued in the report. "All this stuff is already public." "I'm able to deselect my house and my parents. And the whole goal here is to make it easy for people to show what they want to show." 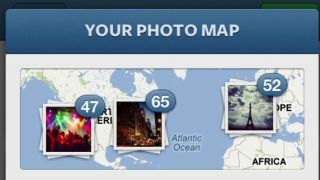 Photo Map may be the biggest addition to Instagram 3.0, but it isn't the only improvement that's been made to the app. Photo uploading has been streamlined, and the ability to infinitely scroll continuously has been added as well. You can also now report and remove spam, and you may notice some quicker speeds all around, though that may be difficult if you don't have the older version of the app handy to compare. Sadly, since Twitter has recently tweaked its API, you'll no longer be able to "Find Friends" though the app. No matter how you look at it, Instagram's 3.0 update is a big one, and it'll be interesting to see just how different a map of the world looks when our pictures are pasted all over it.